Solar energy panels have increased in value as people have learned about the incredible savings that can be earned by installing them on their home and/or business. The down side of this investment is that as the value increases so does the interest of the unscrupulous in our society. Solar energy panels can be found on the black market. 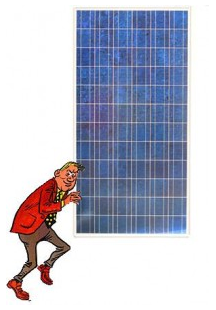 Theft of solar panels has increased around the world. Many homeowners have lost tens of thousands of dollars worth of equipment in single incidents. No one wants to be a victim of any type of theft. However with the size and location of this precious investment a homeowner might be unsure how to best secure this investment. Sure, most homeowners insurance policies would cover this type of theft, but the end result is inconvenience and increased premiums. When affixing panels have the certified solar trained installer use one-way screws or Bryce Fasteners. Do not leave ladders around the house that make it easier for criminals to gain access to the roof. Engrave identification into the panel frames. Do not brag in public about how much you invested in your solar panels. Install movement detector lights on your roof. Chain the panels together with heavy gauge nylon coated wire. While there is no way to stop someone who is very determined from stealing your panels, most thefts are opportunistic, so the more difficult you can make it, the more likely that the parties will give up in frustration. As you want to protect any investment that you make do it right the first time. Installers that have had certified solar training will know of these special tools (i.e. Bryce Fasteners) and be able to secure your investment from the point of installation. Interested in entering the solar energy industry? Whether you need training to become a BPI Analyst, Weatherization Tech, Solar Panel Installer or receive training in solar thermal and solar domestic hot water we have a program. To begin your new career, start training with eRenewable Resource Institute. Contact us at 480 446-0400 or info@erenewableresource.com. This entry was posted on September 15, 2011 at 1:30 am and is filed under Uncategorized. You can follow any responses to this entry through the RSS 2.0 feed. You can leave a response, or trackback from your own site.